The Kyusho is the art of manipulation of the vital points of human body, with the aim of provoking a specific effect. As a result, several conditions may occur: pain, shock, Respiratory disorders, temporary paralysis, strong twisting, joint displacement, fractured bones and internal bleeding. The Kyusho includes not only knowledge of vital points, the study of techniques to cause trauma those points. The other side of Kyusho is the cure. 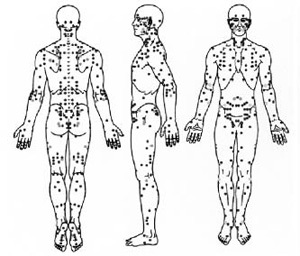 Through the massage of the vital points can alleviate or eliminate common discomforts such as headaches, dor of costs, stress, insomnia, etc..
To be truly effective karate, is necessary to learn the basics of human anatomy and physiology. The Kyusho is a natural complement to the techniques of Karate: We compare the techniques of Karate to an arrow, Kyusho is the poison in the arrowhead.